I realize that Home: A Novel has been out for a little while but I just got my hands on a copy and finally got around to reading it! I've been saying "I mean to" and that "I was gonna" but I hadn't. Now I have. And now I must write the book out of my system. I spent five days reading this book exclusively. If you know me and my reading style, you will know how unique and strange that is. My inability to complete it more quickly had nothing whatsoever to do with nap times, play time, "Mommy, look at this!" time or the like. It had everything to do with me and how much I could process in a sitting. Let me tell you, I wasn't able to process much! As it turns out, Home wasn't just a book to read, it was something to experience. If you are unfamiliar with the tale, it is connected to Robinson's book, Gilead . It is not a sequel and you can read Home all by itself. It stands alone quite well. In fact, I re-skimmed Gilead just to see if I needed a refresher and it turns out that I did not. If I were to look at Home simplistically, I would say that it is a story about a broken family - a son who left home and didn't return for 20 years. In some ways, it is a retelling of the prodigal son except each family member has flaws that they would rather not talk about or deal with. No one knows where this son, Jack, was or what he was doing. But he hasn't really done anything unexpected. Jack has always been a loner, doing things which were unexplainable. Running away for twenty years could be excused with a simple, "That's Jack." Out of eight children, he was the "disreputable" one - the unregenerate son awkwardly stumbled back into the home where his father lay dying. This book is filled with some of the most beautiful prose I'm sure that you could hope to find. It's elegant and it removes all ability to skim a page to get the gist of what's happening. Word by word, line by line, you must work your way through this book and the emotions of each individual character. Work is indeed what this book felt like until about three fourths of the way through until I was struck by a distant memory. I had a friend who was Jack. I remembered that and then I devoured the book. It's very odd to find your life inside of a book - whether it be your life in entirety or just a specific moment in time. Good books are supposed to do that to us. Isn't that what I always argue around here? Well written books are supposed to share a world view and accurately point us to truth. They are supposed to reveal things to us and challenge our thinking processes. Yes, there is a time and place to read for pleasure but reading should also be work. Sometimes books just leap up and smack you between the eyes. They make you think of your past, your present and how you would like to think about your future. She said, "You want to get yourself on better terms with Ames. How can you do that if you don't let him - well - treat you like a friend? Ask you to supper? It's the most ordinary thing in the world." How does Marilyn Robinson know to write about people like Jack? How does she paint the picture so accurately? How can she possibly understand where they are coming from? And how can I? I sailed through the final chapters of this book to get out of it. I'm writing this review, trusting that I will walk away from it. But hidden in unexpected places, Robinson describes humanity - in a million ways. There are no chapters in this book, merely breaks in the page indicating that you can stop and breathe for a moment. But then you must pick it back up and keep going. I'm baffled that she knows how to do this to her reader. This book makes a person laugh because of self recognition. At times, it also makes them cry for the same reason. It is not a simple story so I have no basic description to give to it. Hauntingly beautiful? Mesmerizing? Yes, I could say those things and they would certainly be true. Her fiction carries a great deal of truth. I tried to mark passages to share from but each part that stood out to me was really just a passing moment in a complete story that cannot be mimicked back by a person simply "reviewing" a book. I'm afraid I cannot review it because I breathed in a part of it - and breathed it out again. No, if you want to really know this book you must pick it up and read it for yourself. I cannot read it for you. In fact, the only way that I can help you at all is to announce that the publisher, Picador, has offered TWO copies to give away. Two of you have a chance at winning your own copy of Home: A Novel simply by leaving a comment below. The contest is open to U.S. Residents only and will be open through March 31st. I will announce the winner on April 1st. I think that's something that Jack would approve of somehow. Yes. I do. I've wanted to read Robinson for ages. I'd love to win! I hadn't heard of this before. Count me in! thanks for hosting the giveaway - I have been meaning to read something by this author for awhile! I've never read Gilead or Home, so count me in! Great review, Carrie! You made me WANT to read this one! I may have goofed, but I already read Gilead and loved it. I would now to win and read Home. Sounds like an interesting read. Please enter me. Thanks! I read Gilead several years ago, and I've meant to read Home since it came out. I'd love to win a copy and have one less excuse for not reading it! I have wanted to read this book for a long time but never have. Perhaps it is because I could identify with Jack. Thank you for your generousity in sharing this review with us. I've heard so much about Marilynne Robinson. I would love to read "Home." I would love to win. No need to enter me - I have this one on audio waiting to be read. I put it in and started but it didn't grab me. I had a slow start when I read Gilead too so I am going to try it again. I'm curious how much you liked Gilead? And when you compare the two - did you feel about the same about them both? I have wanted to read this book for the longest time. Some very smart people and very good writers I really respect have recommended it highly. This just clinches it. I'm intrigued. Count me in too. Sounds interesting. Please enter me. I've had family members 'disappear' and come back into our lives. What an incredibly interesting sounding book but also one that would require concentration and reflection. Just the type I like. Please enter me in the giveaway. Thanks. For a while now I have been searching for a great literary novel that I can share with my reading group; even if it isn't great, it would be a welcome departure from our usual reading experience. What a great review! Beautiful prose, truths about humanity...you completely sold me on this one. Thanks for the giveaway! Just to affirm your position, I listened to Home on audiobook -- great by the way (reviewed HERE). I didn't read Gilead, and I'm not sure I want to. It seems awfully slow to me, while I thought HOME had a lot of character drama in why Jack was there etc. However, I think having read it, the backstory that Gilead supplies might be more interesting to me??? (I probably don't need to win since I own the audiobook). Sounds great! I would love to be entered! Sounds like a very touching book. I'd like a chance to read it. Please enter me. Thanks! 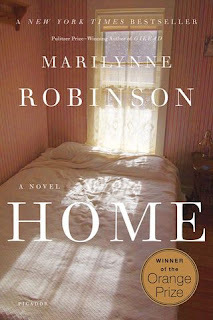 Okay, in a weird coincidence, I had just heard about Marilynne Robinson for the first time in the post right ahead of this one in my reader, recommending her book Home. I went over to Goodreads and put it on my to-read list, and then scroll down to this post...now I REALLY want to read something by her!